Bantu Continua Uhuru Consciousness (BCUC) moves the audience – both physically and emotionally with an explosion of passion, funk and rhythm. With their music, straight from the ancestors BCUC wants to question the common worldview on modern Africa. The basic ingredients of BCUC’s sound are the traditional whistle, percussion and a rocking guitar. Topped by the raw combative voice of Jovi, flowing rap by Luja and Hloni, the sweet and clear vocals of Kgomotso – the only woman in the band – and chants of all four vocals together. They baptized their unique sound as ‘indigenous funky soul’. BCUC takes the audience along on an intriguing journey to the secret world of modern Africa. They want to rectify western assumptions and show the South Africa from after apartheid from a young, contemporary, different perspective. Mandela and Tutu are not their heroes. Mandela is a millionaire, a shameless fundraiser and Tutu a spy. In eleven languages BCUC discusses the harsh reality of Africa where especially the unemployed worker forever stays at the bottom of the food chain. And also they tap into the elusiveness of the spirit world of ancestors that fascinates them. Africa portrayed by BCUC is not poor at all, but rich in tradition, rituals and believe. 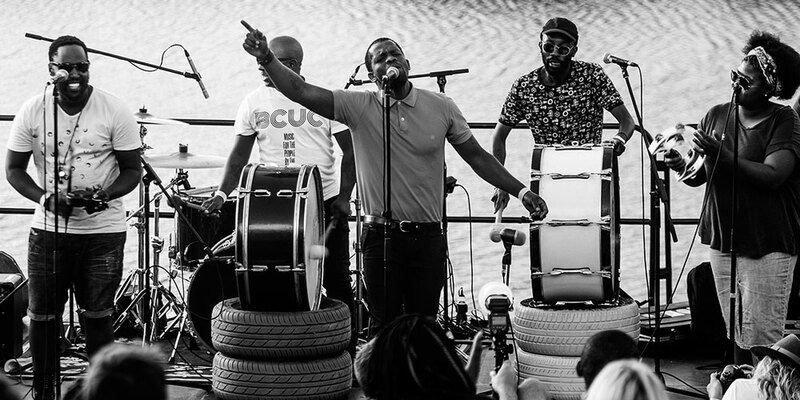 Highlights of BCUC’s musical journey are performances at Gentse Feesten (Belgium), Festival Mundial Tilburg and Melkweg Amsterdam (Netherlands). BCUC was selected as one of the finalists by a panel of Tony Allen (drummer Fela Kuti) and others at AfricaUnsigned.com. Africa Unsigned supports African unsigned musicians to record music funded by fans. We’ve been fortune enough to bare witness to two powerful shows by BCUC. They opened for Atlanta-based flower punks The Black Lips on their Psych Night South African tour in 2015 and moved audiences again in March 2016 when they rocked a packed out Assembly in Cape Town. We can;t wait to see them on a festival stage as part of our line up for Endless Daze 2016! Listen to some of their selected songs below.